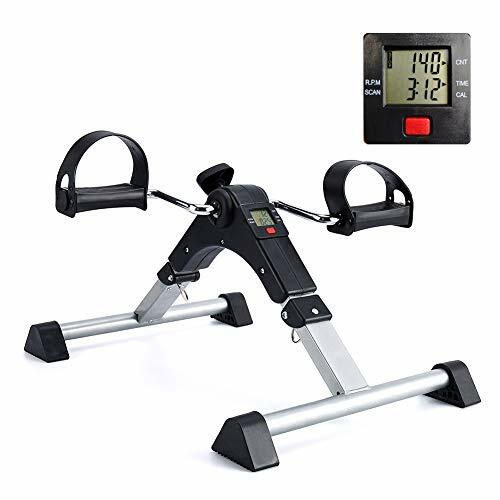 KEEP FIT EASILY: This pedal exerciser is designed for people do not have enough time to exercise, with this under desk exercise bike you can exercise in the office or when you are watching TV at home. ADJUSTABLE TENSION: You can adjust the intensity according to your ability with the resistance screw, tone and strengthen muscles for arms and legs. TRACK YOUR EXERCISE: LCD monitor records the count, time, calories and R.P.M., making your exercise more reasonable and effective. WORKOUT ANYWHERE: Portable folding exercise bike is compact designed, can be folded and take to anywhere, such as home, office, park etc. Sturdy frame and non-slip feet keeps safety, ultra quiet operation provide a comfortable sense of use. WHAT YOU GET: A SYNTEAM foldable pedal exerciser, a manual.